A new exhibit focuses on maps of fictional worlds. Not all literary maps are as charmingly obtuse. Spain’s Royal cartographer, Tomás López, designed a gloriously detailed copperplate map of Don Quixote and Sancho Panza’s travels. Madeleine de Scudéry’s 17th-century novel Clélie includes the famous Carte de Tendre, an allegorical map showing the path to love (beware the Lake of Indifference!). 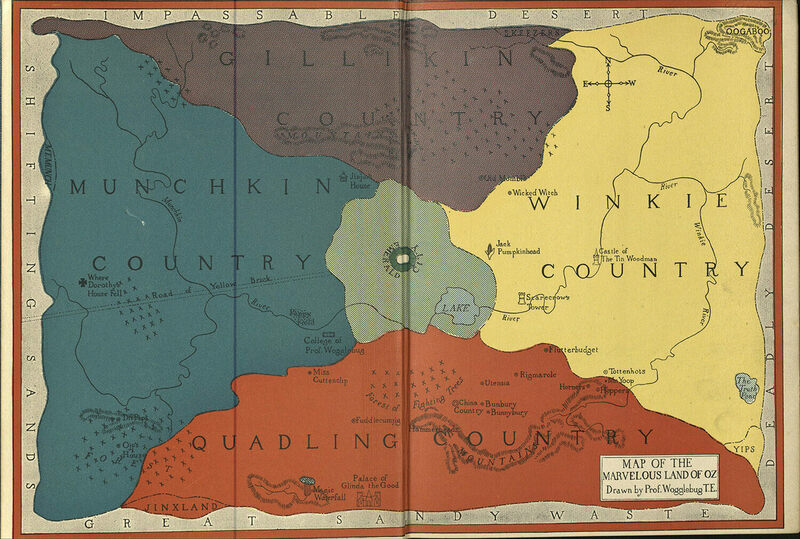 There’s also L. Frank Baum’s first printed map of the Marvelous Land of Oz, pictured above, with its four counties surrounding the Emerald City. There are some curiosities to this map: both east and west, and the position of Munchkin and Winkie counties, are flipped. These are just a few of over 60 maps that are currently on display at the exhibition Landmarks: Maps as Literary Illustration, at Harvard’s Houghton Library. The collection includes the work of landmark authors such as J. R. R. Tolkien and the late Ursula K. Le Guin, and spans everything from love stories to fairy tales. The exhibition is open through to April 14, 2018; Atlas Obscura has a selection of these literary maps. A new book collects fantastic literary geographies.